FREE delivery to United Kingdom in 8 - 12 working days. 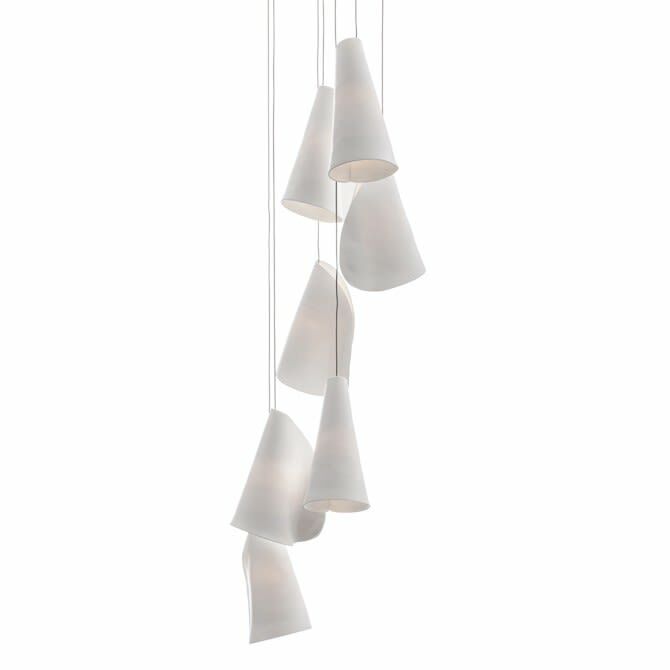 21 results from a fabrication process in which thin porcelain sheets are draped over an inverted diffuser made of sandblasted borosilicate glass. The thin porcelain skin is allowed to dress the borosilicate core in whatever form occurs naturally – creating a unique shape in every iteration of the fabrication process. Each glass diffuser houses a low-voltage xenon or LED lamp. A strong contrast occurs between the soft, organically distributed light passing through the white porcelain skin and the crisp light moving through the glass diffuser. 21s are designed to cluster in groups, with individual pieces touching each other to create a layered composition in three dimensions. Omer Arbel explores the intrinsic mechanical, physical, and chemical qualities of materials as fundamental departure points for making work. Arbel’s pieces have been exhibited at the Victoria and Albert Museum, Spazio Rossana Orlandi, Mallett, Monte Clark Gallery and Dimore Gallery. He is the recipient of the 2010 Ronald J. Thom Award for Early Design Achievement and the 2015 Royal Architectural Institute of Canada Allied Arts Medal. Omer Arbel is the creative director of Bocci. Bocci is a contemporary design and manufacturing company based in Vancouver and Berlin.